Cate Shortland’s provocative and haunting film, turns her beautiful face towards the camera and commences the unravelling of her contorted mind of lies. The chorally haunted forests of Schwarzwald provide the setting for an epic journey’s beginning, as Lore’s high ranking Nazi parents disappear into the forests deep in the American enclave, leaving their five children to find a way through the aftermath of WWII to Grandmother’s in Hamburg. 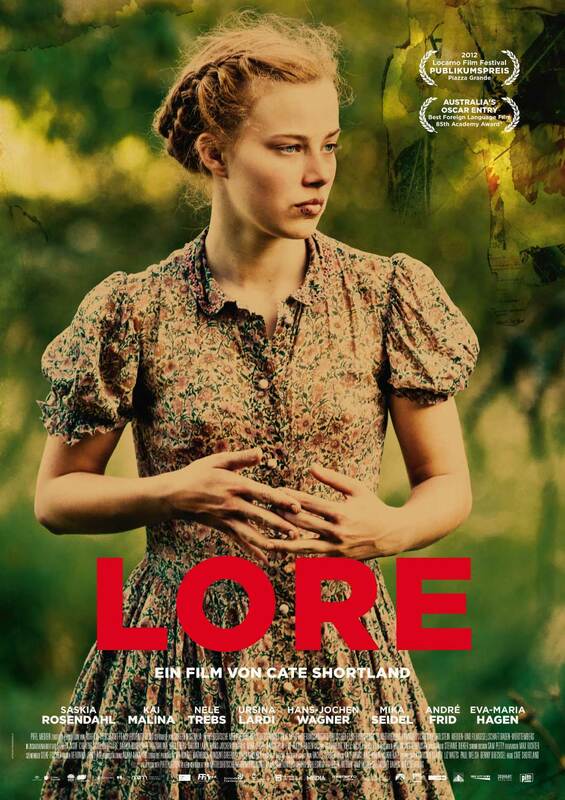 The extraordinary Saskia Rosendahl’s ‘Lore’ is forced to confront her Nazi indoctrination, anti-Semitism and hero-worshipping of her father whom she discovers to be a war criminal responsible for genocide; she witnesses the scaling denial of a nation, all whilst leading her young brothers, including baby Peter and her younger sister Liesel to safety. Adam Arkapaw’s stunning cinematography often gentle and sun-blanched, has wisps of Gerhard Richter’s paintings flickering through it. A motion parallel to Richter’s ‘Betty’, 1988 (Richter was himself a child during WWII) and homage to his blurred photo-paintings echo throughout the film especially in the sequence when Lore dances with her sister Liesel. Many refugees experienced chance, often fleeting encounters with strangers who changed the course of their lives in the unwinding chaos of WWII Europe. A Jewish concentration camp survivor, Kai Malina’s ‘Thomas’, covets Lore and eventually becomes the sibling’s guardian angel whilst Lore’s beliefs and body crumble in the rubble and decay of ‘Gomorrah’. A good review of a much-praised film, and one that I would really like to see. Even more so, now you have introduced me to the story. Regards from Norfolk, Pete. I’ve never heard of this movie, I’ll have to give it a try. Ditto. Going to have to see this move at some point. Sounds really good. Great film and lovely review. I love the purpose and aim of your blog! I borrowed this film from the library and absolutely loved it. I talked about it briefly here. Oh, there may be a couple of spoilers, if you care about that.